Those of you who read this site regularly know that, aside from the usual action fare, we will review a classic 80’s dance movie from time to time. Well, they don’t get any more classic than Breakin’, a gem of a movie that is well known for good reason. Kelly Bennett (Dickey) is a waitress who is an aspiring dancer. Strictly by chance, she witnesses the street dancing of Ozone (Quinones) and his buddy Turbo (Chambers) and her life is changed forever. She befriends the two, and just in the nick of time. A dance crew comprised of two men and one woman, the Electro Rock crew, has challenged them to a dance-off. But Ozone and Turbo must teach Kelly, now dubbed Special K, the ways of Breakin’. Now shed of her formal dance training, she goes to her agent James (McDonald) for his support. He is reluctant at first, but once he sees TKO, as they are now called (“Turbo, Kelly and Ozone”, get it? ), he is won over. Plus a potential love rivalry between James, Ozone, and Kelly’s former dance instructor Franco (Lokey) is making Kelly’s life even more complicated, as is Ozone’s hot temper and his loyalty to “the streets”. Will TKO pop and lock their way to fame? Breakin’ is nothing more than infectious, irresistible fun. It’s filled with charm and 80’s nostalgia, thanks to the music and clothing. There’s plenty of creativity on display in the dance moves and the outfits. Plus it’s positive. It really celebrates friendship and the can-do spirit. It comes from a time when battles were fought on the dance floor with moves, not on the streets with weapons. They truly don’t make ‘em like this anymore. That’s why people gravitate to movies like this today. Because they are not making any more of them. Interestingly, because this is a Cannon film, a young Van Damme can be seen in a crowd scene clapping along to the beat and smiling away. Naturally, he’s wearing a black wrestling singlet for no reason. He’s not listed in the credits, but it’s clearly him. Ice-T makes an appearance as the “Rap Talker” at the club Radiotron. His role would be highlighted a bit more in the follow-up film. Plus, this brings into focus that this movie isn’t that far of a departure from the action films we normally watch. A Cannon movie featuring Van Damme, Christopher McDonald and Ice-T is pretty much par for the course for us. But instead of fight scenes, there are dance scenes, and the training sequences are to learn dance moves, not fighting moves. Two sides of a coin I tell ya. To compare this to some other movies we have on the site, Ben Lokey as Franco is very Roy Kieffer-like as the dance instructor, recalling Dance or Die (1987), the whole clash of “high” and “low” cultures aspect is also explored in Knights of the City (1985), and, while the soundtrack is good and vitally important, we felt the soundtrack to Body Rock (1984) was better because it had more memorable songs. Director Joel Silberg went on to direct Rappin’ (1985) as well as Lambada (1990), so we know where his head is at. He did not go on to direct the Breakin’ sequel however. But after Breakin’ ends, there is a big on-screen announcement: “Coming Soon: Electric Boogaloo: The Dance Sensation of Tomorrow”. So they knew then that there would be a sequel. There’s just too much energy to be contained in one movie. It’s colorful, fun, funny, and even heartwarming. What’s not to like? 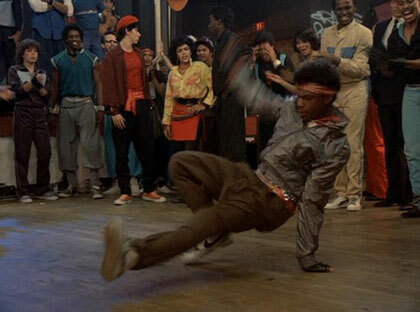 Anyone who hasn’t already seen Breakin’ definitely should. Oh my God LMAO. As a kid of the 80's I grew up with the breakdancin fad. We would pull out sheets of cardboard and badly attempt to dance. Now you have to do Electric Boogaloo and Beat Street! Haha! That is awesome you breakdanced! We have an Eletric Boogaloo review coming soon. We will try to get a copy of Beat Street. Incredible! Kudos for spotting JCVD! I respectfully submit my own write-up of Electric Boogaloo for your perusal. OMG breakin is awesome! I love getting together to watch this. It's just bad enough to watch, not too bad to where you can't even get through it for a laugh (ala Breakin' 2, electric boogaloo. Michael Van Zant: Thanks for linking your review too! Your review is hilarious. If only JCVD was in it more, this would have even better! 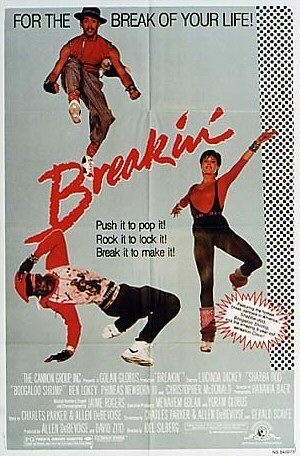 Hoaks2: Breakin' is a blast to watch. Breakin' 2 is a million times more silly than the first one. The hospital scene is a standout. Haha! Thanks for the Van Damme gif, Anonymous stranger! Ty where are you on Twitter brother? you gotta be there! We are definitely going to be expanding our twitter presence! We are at @TyComeuppance. This is a great movie, and I like the mention of the connection to action films, because I've mentioned that myself. A good action movie should have the pacing of a musical or dance film, not the pacing of a dramatic piece. Plot is important, but not as important as the musical or dance numbers, or in the case of the action film, fight scenes. Glad you gave this one a look, great stuff as always. Thanks for the kind words, DTVC! Action and Dance movies can have similar pacing and have more similarities than people realize. Lambada now there's a movie! Great idea! Looking forward to that.